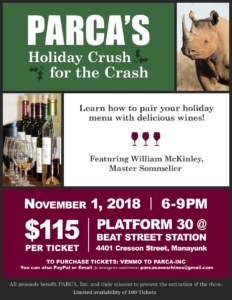 You are invited to join PARCA for our first Holiday Crush for the Crash on 11/1! Join us at Platform 30 @ Beat Street Station in Manayunk for an evening of sipping, tasting, learning, and saving a species. We will have a cocktail hour from 6-7 with stationary and passed hors d’oeuvres. Then from 7-9, Master Sommelier Bill McKinley will guide us through the 3 whites and 3 reds we will taste. There will be some surprises that night (we’ll share one now…your ticket is also a chance to win one of several great gifts we’ll be giving away to our supporters)! A cash bar will be open all night. Infinity Catering will be providing us with delicious food! Tickets are $115. To reserve a ticket, email us at parcasavesrhinos@gmail.com or send payment via PayPal to our email address or via Venmo to PARCA-Inc. More details will be sent to attendees one week before the event. Bring your friends for what promises to be a great night out!